Wait a minute—I thought the team had broken up?! Shadow Chick went back to her home planet (and her spaceship exploded on the way), Plastic Man was having an awkward family reunion, and Rex Mason was sponging off his girlfriend Sapphire. Everything was going just fine, even Mr. 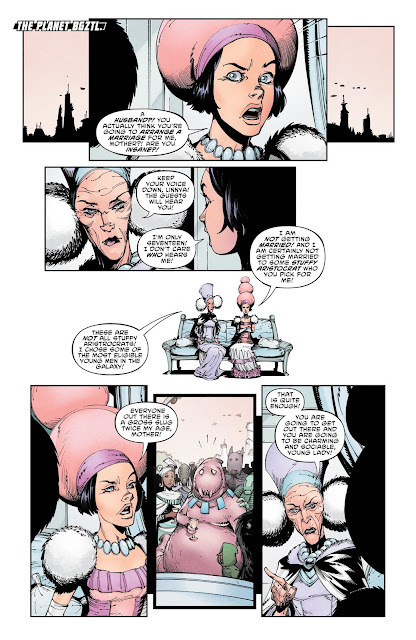 Terrific was as happy as a pig in poop, gallivanting around the multiverse. So what more needs to be said? Anything significant? 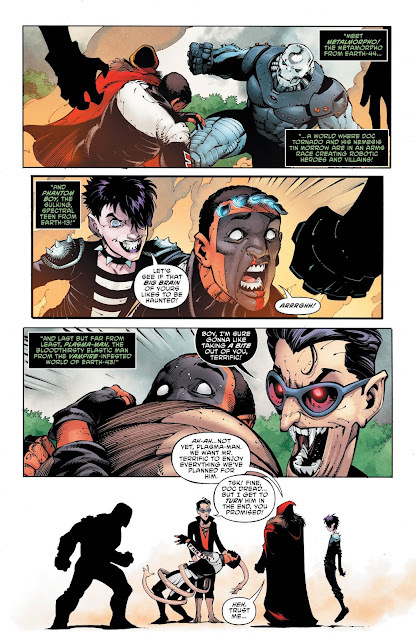 You can find out in my review of The Terrifics #12, which has been posted below for your perusal! 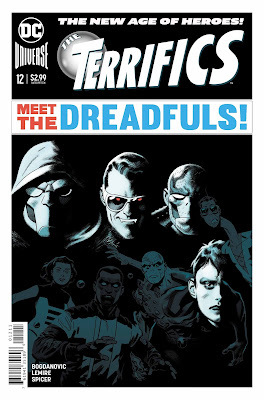 The end of the last issue teased one of the more interesting things that we’ve seen in this series for a little while: a new team of multiversal baddies, convened by Java aka Doctor Dread, who are alternate versions of the heroes that make up the titular team. There’s Metalmorpho of Earth-44, who is like the Metal Men combined with Metamorpho; Phantom Boy of Earth-13, who looks like a sulky teen and (unlike Phantom Girl) knows how to use his powers; and Plasma-Man from Earth-43, a vampiric Plastic Man. With Dread at the helm, this group is known as the Dreadfuls! And they’re beating the snot out of Mr. Terrific, who just had to go poking his nose into Java’s business. And not only that, but they’re clobbering him right outside the home base of the Mr. 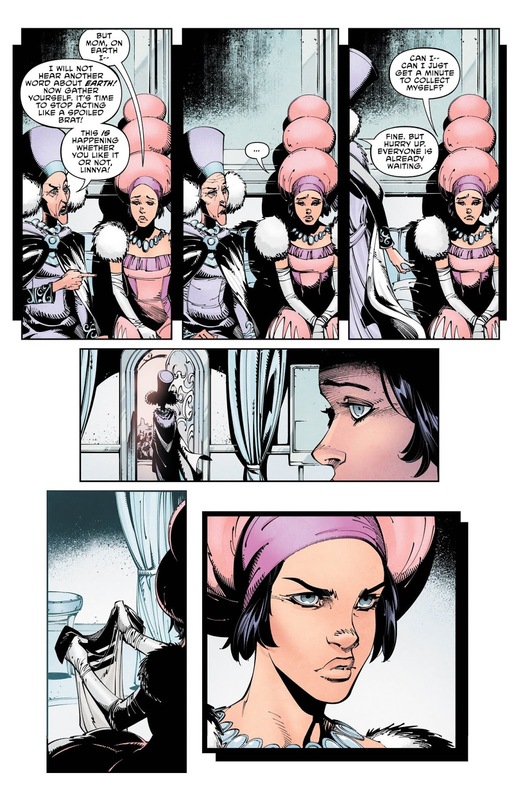 Terrific of Earth-23…who is the spitting image of our Mr. Terrific’s wife, Paula! Making her Mrs. Terrific, technically speaking. Meanwhile, on the planet Bgtzl, Linnya’s mom is forcing her to go through with this arranged marriage, but then she’s like “nah,” and hops on a spaceship back to Earth. Rex Mason heads over to Stagg Industries—where he still has security clearance, though he appeared to burn his bridges with Stagg a couple of issues ago—and destroy the Orb of Ra so he won’t accidentally turn into Metamorpho again. And hey! He brought along that dog the picked up several issues ago, the one who used to be Metamorpho Dog? I guess he’s on hand to see the Orb of Ra finally destroyed, which would be very meaningful to a OH FOR CRYING OUT LOUD OF COURSE THEY BOTH TURN BACK INTO METAMORPHOS, IT WAS A FOREGONE CONCLUSION THE MINUTE THEY ENTERED THE ROOM! The most touching thing in the book is Plastic Man trying to make nice with his son Luke, who resents his pop for having been in stasis as an egg for so long. 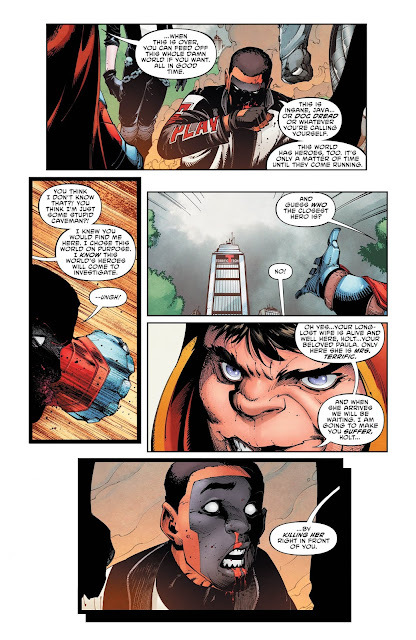 Plas buys his son’s love by stealing the Batmobile for a joyride, and then taking him along to answer a Terrifics-Alarm sent by Linnya, who has wound up in Mr. Terrific’s laboratory, and can see his distress on Earth-23 on the viewscreen! This event, incidentally, is what makes Rex Mason decide to “suit up” again, though like I wrote, you knew it was going to happen the second he got entrance to Stagg’s building. And to be honest, I didn’t buy it. This was supposed to be a major sacrifice Rex is making for his best friends, and it seemed completely arbitrary, and contrary to what we know of the character already. Perhaps if I could recall any big bonding moments, times Metamorpho had a heart-to-heart with anyone on the team, or had his life saved in some impressionable way…but it never happened. So it seems like he went to the Orb of Ra to become Metamorpho, despite outward appearance to the contrary. As for Linnya’s bit, what a whole lot of nothing. I realize this could seed stories later on—if the series lasts that long—but for all the effect it had on the story, she might as well have just gone to the bathroom during the interim. Plastic Man reuniting with his son, besides having some continuity juice, was the only part with palpable feeling, and it was still goofy as hell and went on for way too many pages. The Terrifics are back together, but you’ll barely realize they were apart. Threatened by a far more interesting team of villains, the Terrifics have to figure out how to fill out an entire issue so the thing we know will happen occurs on the last page. Does Linnya have enough character development to support her own side story? Does anyone remember Mr. Terrific's sob story that he revealed like eight issues ago? For three bucks, you can find out! Bring on Yang already. I love Lemire but his heart is not in this one.